do i prune the knock out rose tree in a round shape as it grows? 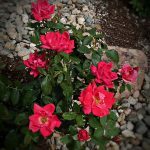 Any pruning you do to the Knock Out Rose Tree as she grows will take away from her blooms production. You can lightly prune her to keep a shape you desire, just be aware that it will likely affect the blooms for one cycle.